Learn more about our Chinese food tour in Shanghai, which includes 6 dinners and 6 lunches that encompass 12 different types of Chinese cuisine. Join the best food tour in Asia! For lunch and dinner we'll experience 12 different types of Chinese cuisine from various regions of China. At the hotel breakfast buffet each morning there will be both western and Chinese food. Chinese food is eaten family style, which means that unlike typical western food, each person is not given a plate of their own food to eat. Instead, all food dishes at each restaurant will be brought to the center of the table and shared by all trip participants. You can feel free to eat as much or as little as you want, and be as adventurous (or not) as you like! Go here to see the FAQ about meals and food on this trip. See below for descriptions of the different types of food we'll eat. A special type of dumpling served hot in a bamboo basket, these steamed dumplings originated in Shanghai and come in many varieties. They are often filled with soup, which makes for a delicious combination of senses in the mouth. We’ll visit an off-the-beaten-path dumpling spot popular with the locals, so you can get a true sense of how Shanghainese citizens enjoy one of their favorite types of food. In the southern part of China, bordering Vietnam, Laos, and Burma, is the province of Yunnan. Dishes from this part of China are known for featuring a variety of different mushrooms, as well as other plants and vegetables. Famous dishes include "crossing the bridge" noodles, wild mushrooms, rice noodles, steam pot chicken, roasted rice cakes, and cheese made from cow's or goat's milk. 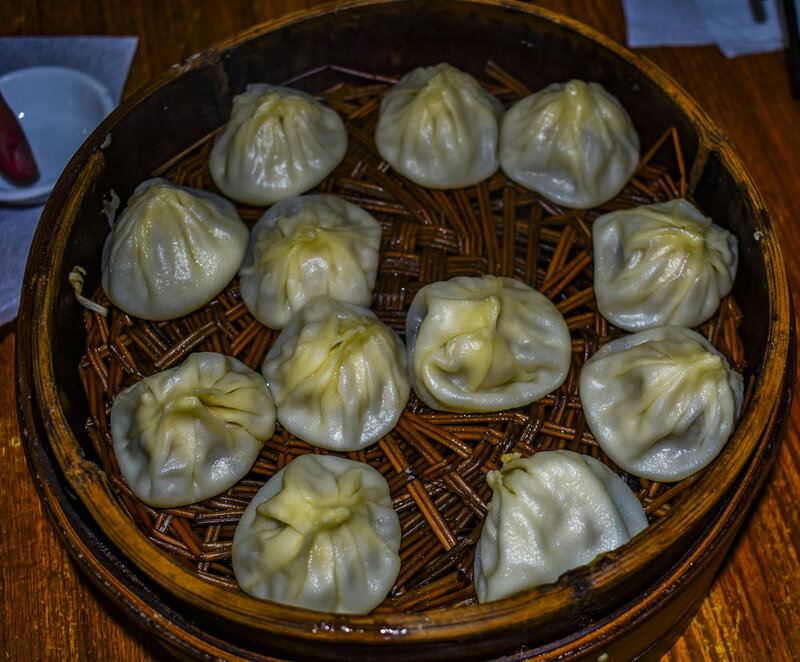 A type of dumpling with a crunchy bottom, soft body, and pork/shrimp/vegetable soup combination on the inside, the type of dumpling called "shengjian bao" is a staple of the Shanghai diet, and is absolutely delicious! Add a side of beef curry soup to complement the dumplings and you'll be a very happy person after this meal. Famous for it's liberal use of garlic, chili peppers, and the unique flavor of the Sichuan peppercorn, Sichuan cuisine is known throughout the world for its bold flavors. 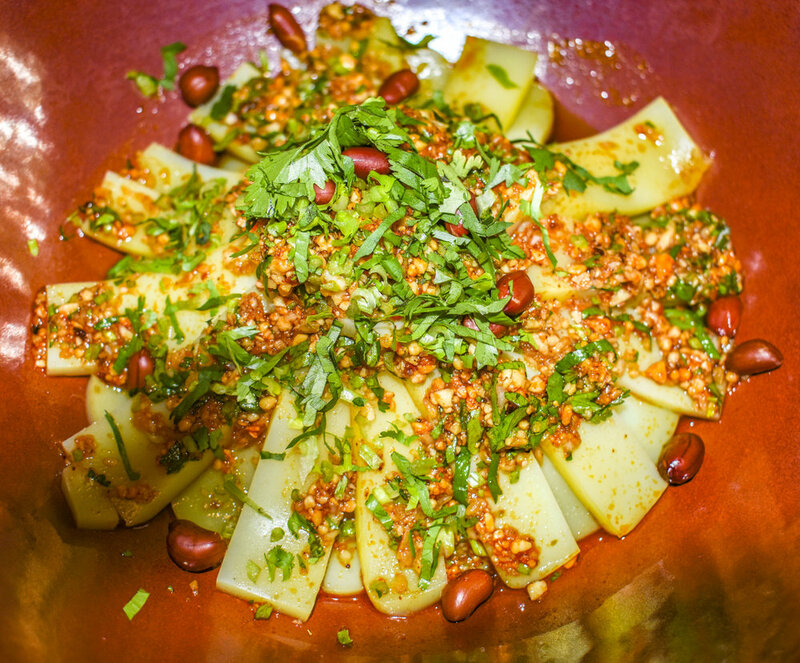 Some common Sichuan dishes include dandan mian (noodles), huiguorou (double-cooked pork), kung-pao chicken, and fuqi feipian (sliced beef). Due to the large number of emigrants from the Guangdong area in China, Cantonese cuisine plays an extremely prominent role in Chinese cuisine overseas. In fact, the majority of Chinese food eaten in the USA can be described as Cantonese food. Dim sum is one of the more famous styles of Cantonese cuisine. Famous dishes include sweet and sour pork, rice noodle roll, wonton noodles, pork buns, roast goose, and duck. Cantonese desserts include flavors/ingredients such as black sesame, red bean, egg custard, and shaved ice. As the capital of China, Beijing cuisine has been influenced heavily by food from other parts of China, but there are definitely some specific items that are famous in Beijing - the most famous one being Peking duck. Other well-known dishes include stir-fried tomatoes and scrambled eggs, dumplings, noodles (zhajiangmian), stuffed fried panckes (jianbing), and many more. Each person will have their own individual hot pot, which consists of a simmering pot of flavored stock of your flavor choice. You’ll then put a variety of raw meats, vegetables, noodles, seafood, and other items into your pot, which cook very quickly. Lastly you’ll dip each item in a sauce (of your flavor choice) and then enjoy this wonderful and extremely popular food. Located in the far upper northwest corner of China, the Xinjiang region has their own distinct way of life, culture, and food. We'll enjoy a traditional singing/dancing performance at a Xinjiang restaurant while feasting on specialties such as lagman (meat and vegetables over noodles), dapanji (chicken and potatoes), kebab (lamb, beef, chicken), and polu (rice dish). Just to the north of Shanghai, the capital of Jiangsu province is called Nanjing, an area known for delectable treats, often accompanied by soup, and often with exquisite presentation. Some of the more well-known dishes include steamed dumplings, duck blood soup, sesame pancakes, hairy crab, and a variety of seafood from the nearby ocean waters. Hailing from the landlocked province of Shaanxi is a type of cuisine best known for noodles as well as lamb/mutton dishes. The food has a reputation for having a heavy taste and a strong flavor. At a local Shaanxi restaurant we'll taste such items as biangbiang noodles, roujiamo (a hamburger-type food filled with pork or lamb), and lamb soup. Famous for its liberal use of chili peppers, garlic, and shallots, Hunan cuisine is hot and spicy! But don't worry if you don't like hot or spicy food, as there's plenty of other types of food you can try. Some well known dishes include beer duck, dry-wok chicken, Mao's braised pork, spare ribs steamed in bamboo, and pumpkin cake. As a tiny island off the coast of mainland China, Taiwanese cuisine takes influences not only from China, but also from Japan since it was ruled by the Japanese for a period in the early 20th century. Seafood plays a major role in Taiwanese cuisine, as well as pork, chicken, rice, and soy. One of the most fun parts includes some eye-catching desserts, made up of beans, shaved ice, and fruit.